Editor's note: Phillip F. Nelson coauthored this piece. It was Victor Hugo, the 19th Century writer and statesman who said, "Legendary truth is of another nature than historical truth. Legendary truth is invention whose result is reality." These axioms readily explain the confusion of so many people in the wake of the early reviews of the movie Selma and the disparate array of opinions being offered about the movie's treatment of Lyndon B. Johnson. His once-aide and confidant, Joseph Califano, in an effort to further strengthen Johnson's legend, even asserted that the whole idea of Selma sprang from LBJ. That was a surprise to those folks who lived through that sordid episode of U.S. history in the deep South, who knew that it was the culmination of a very long and difficult road that found its way through Selma and on to Montgomery, Alabama in 1965. That story, not to put too fine a point on it, was not one that had been guided by the White House in any way, whatsoever. And it certainly was not one guided in any way by Lyndon B. Johnson, who, until November 22, 1963, had consistently been one of the biggest impediments of meaningful civil rights reform at a time in history when churches were burning and black protestors were putting their lives on the line to achieve what LBJ had adamantly prevented, for at least twenty-five years. His only, at best feeble, claim—of supporting the 1957 and 1960 so-called civil rights acts—was itself disingenuous, since these were bills from which he had stripped any effective enforcement mechanisms; in fact, his clever plotting led him to replace the requirement of federal jurisdiction with state juries and that ensured that all-white juries would remain in place, thus ensuring the outcome would be unaffected by maintaining the status quo. Both of these bills were anathema to northern liberals, and liked only by southern segregationists, who knew they were no more effective than "popcorn farts" as Johnson used to say. In fact, on at least twelve occasions during his time in Congress (1937-1960) he voted against acts that would have prohibited the use of literacy tests and poll taxes, the devices that had been designed for the very purpose of prohibiting blacks from voting. His history on this issue was such a sore subject by the time he became president that he took actions to hide it, by attempting to keep certain records of his public speeches "off the record." Given the long history of Johnson's consistent positions against real civil rights reforms— plus the nearly three year period of his vice presidency as he "marked time" by counseling JFK to "go slow on civil rights . . . .we must wait until the time is right"—it is astounding that Andrew O'Hehir, writing in Salon (Jan 6, 2015), stated: "But to suggest that Johnson was in any way an impediment to enacting voting-rights legislation is grossly unfair." The fact that no qualification whatsoever of this assertion (e.g. "after becoming president on November 22, 1963") was made, proves that the myth has become the "reality," thus the "truth." But when such a "truth" is based upon a misstatement, or a lie, it becomes a "myth" of an entirely different kind than the ancient Greek myths, which were generally wrapped around essential truths. It is the clash of such grotesque "myths," with actual historic "truths," that causes the recent confusion that readers of publications as diverse as the New York Times, Salon, theHuffington Post and others have had to endure in the first week of the new year. As a respected historian, David Kaiser, writing in Time (time.com Jan. 9, 2015), "Why You Should Care That Selma Gets LBJ Wrong" should have known this part of pre-presidential LBJ history; but that would contradict the paradigm. That history rebuts the entire article, starting with its title. The real history of Johnson as a steadfast segregationist up until he became president on November 22, 1963, actually bolsters the arguments for portraying Johnson as the movie has correctly done, in the context of the entirety of his congressional, vice presidential and presidential record: Selma shows the LBJ persona and his complete history, as he and it was, at first as the leading impediment to civil rights reform, then, on becoming president, his 180 degree flip-flop to become its leading proponent. In 1964-65, the arcs of the two of them coincided, but after that their orbits shifted again, and took completely different directions by 1966-67. Johnson's dogged pursuit of a faraway, completely staged and unnecessary war, for which he exploited the patriotism of credulous young men — a war fought essentially for his own personal, political and pecuniary gain, in his deluded mind — caused a fundamental split between these men that festered until MLK's assassination on April 4, 1968. Nearly thirty years later The New York Times, on June 20, 1997, reported that Dexter Scott King, MLK's son speaking for the King family, announced their finding that LBJ and the FBI were behind the assassination, which was carried out by the military and intelligence apparatus of the United States government. That Johnson has now become widely known for supposedly being the greatest civil rights hero in history, is the result of a generational shift coinciding with a distorted "history" based upon a larger set of myths, mostly of his own creation. Thus the lie, transformed to myth, has come full circle and has now permeated the masses. That is evidenced by the following random, representative response to Mr. O'Hehir's Salon column noted previously, by someone using the moniker of RedhairinDixie: "What gets me in all this is it has taken decades for historians and educated Americans to see LBJ's accomplishments / genius really clearly. At the time he was portrayed by the press as a rube! I was living in Texas at the time, only 12, but I bought into this also unfortunately. I now know the truth." Alas, RedhairinDixie, you have been deluded into accepting the myth, not the reality, of what constitutes "the truth." With his words in the epigraph above, JFK arguably put his finger on the single biggest intrinsic difference in his core values and attitudes, vs. those of his vice president Lyndon B. Johnson, about the importance of truth and transparency in all public matters (which is, admittedly, incongruous with how he conducted his private matters). Without saying as much, he had probably learned about many of the dark secrets Johnson was attempting to hide when he made that statement. Indeed, that might have been the catalyst of the quote. By 1962, JFK had become acutely aware of the secretive and brazenly illegal schemes being run by Johnson "behind-the-scenes" and this became the primary reason that he and his brother, Robert F. Kennedy had decided to remove Johnson from the 1964 ticket, replaced by Gov. Terry Sanford of North Carolina, according to Kennedy's secretary, Evelyn Lincoln. A series of embarrassing scandals surrounded LBJ through 1961-63, and were being reported in the nation's newspapers throughout JFK's administration. Among them was the so-called "TFX" scandal involving kickbacks by favored defense contractors seeking special, highly-profitable favors from politicians willing to sell their political influence. Lyndon Johnson's door was always open to anyone willing to "pay to play" and there were many such opportunities for that. Another involved a flamboyant Texas entrepreneur gifted with an ability to see multiple ways to defraud the government; his name was Billie Sol Estes, and the stories of his various schemes, together with an expanding list of "suicides" of his associates, made national newspapers and considerable time on the three television networks all during 1962. As soon as that was beginning to dissolve into the dustbin of history—thanks to Johnson's maneuvers to have other wealthy friends take over Estes' remaining assets, as a way to remove the stories from those newspapers—the even more outrageous scandals involving Johnson and Bobby Baker began appearing in 1963. The news reports appeared in practically every newspaper in the United States for months on end. But readers will find little in the major LBJ biographies about either of his major partners in crime; in the case of Estes, there is nothing about him in Robert Caro's so-far four volume / 3,382 page tome. Baker's name surfaces, though the frequency and depth of his close relationship as reported is not nearly commensurate with his actual involvement in some of Johnson's most sordid affairs. 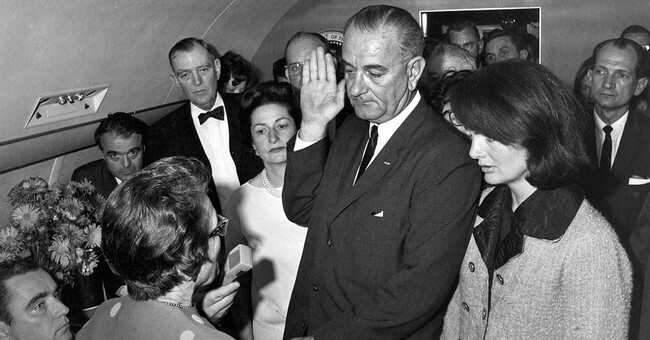 The extraordinary dichotomy which Selma has brought to the surface— created by the chasm between LBJ's mythical legacy as a life-long champion of civil rights, in contrast to his own sorry record of exploiting the divisions that existed for a quarter of a century, as he delayed taking any substantive actions to defuse the time-bomb that he had created—is a stunning example of the success of the mythmakers. It is also a testament to the success to the state of political correctness today, including the widespread achievement of public acceptance of this repackaged piece of presidential hypocrisy, masquerading as grand mythology. The disconnect we have collectively witnessed, initiated by the director of the LBJ Library, Mark Updegrove, stoked by Joseph Califano and poked by dozens of others from every direction, is the inevitable result of the clash of "true history" caught in a time warp with a set of myths created originally by Johnson himself, then perpetuated by the government to hide the secrets of the assassination and Johnson’s presidency . . . and, clearly, of Lyndon Johnson himself.